Obviously not at the NCPEV street booth, the totally solar electric MOG was in her Wilmington, NC slip. No, it is not a new rock group but the folks from Advanced Energy, NCPEV definitely rocked the Wilmington Azalea Festival in the middle of Front and Chestnut Streets. From Raleigh, NC came the team that showed where the future for personal Plug-in Electric Vehicles (PEV) is headed and just how all of the folks in NC are going to get there. On display were child and adult oriented displays that keyed in on the transportation interests of the festival goers. 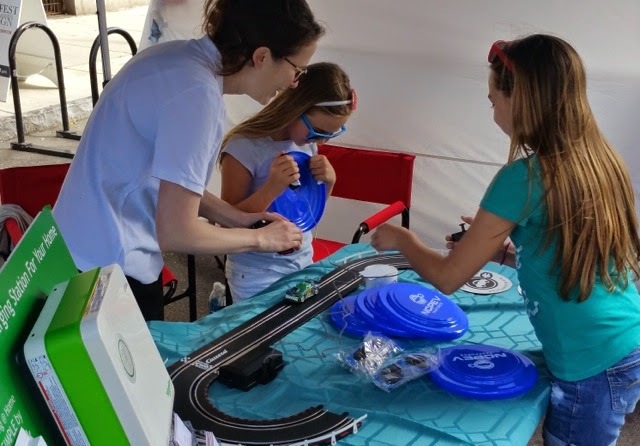 A Nissan Leaf, Tesla S, Schneider solar controller, nifty handouts and a mini electric car race track, pulled walkers to a standstill. Once people's attention was happily engaged, the basics of personal electric transportation were discussed, while onlookers got some actual hands-on with the cars and mock 'fueling' operation. The team was not only knowledgable but most affable, being appreciated by the many visitors to the booth. Katie Drye of NCPEV shows the way to the electric future. The booth was run continuously by the group from Advanced Energy, from just before 10am until a bit after 6pm, each of the two days. It was obvious that the group had picked a great venue and site. Even better, the weather was absolutely perfect. Frankly, the small amount of rain just prior to the 10am opening, washed a lot of pine pollen away, giving just the right glimmer in the morning sun. A representative from Capital Ford (Nissan Leaf shown) stands with Ward of NCPEV at right, while prospective electric vehicle users examine the front motor compartment and try the recharge plug. 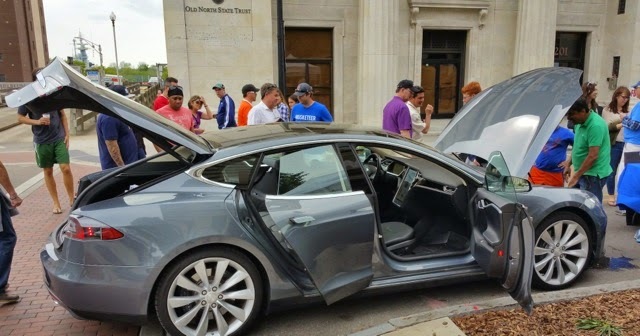 Matthew of NCPEV (at center in blue shirt) talks with the crowd of interested Azalea Festival attendees about the finer points of the well designed Tesla Model S car. 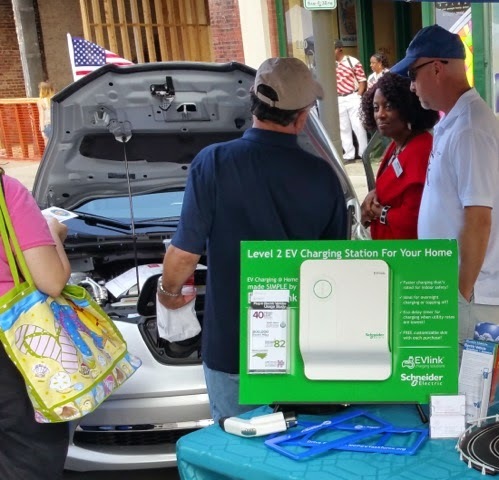 Our thanks to the folks at Advanced Energy/NCPEV for taking the time to show how electric transportation is having a positive impact on the lives of all North Carolinians and we look forward to seeing you again soon in Wilmington, NC. 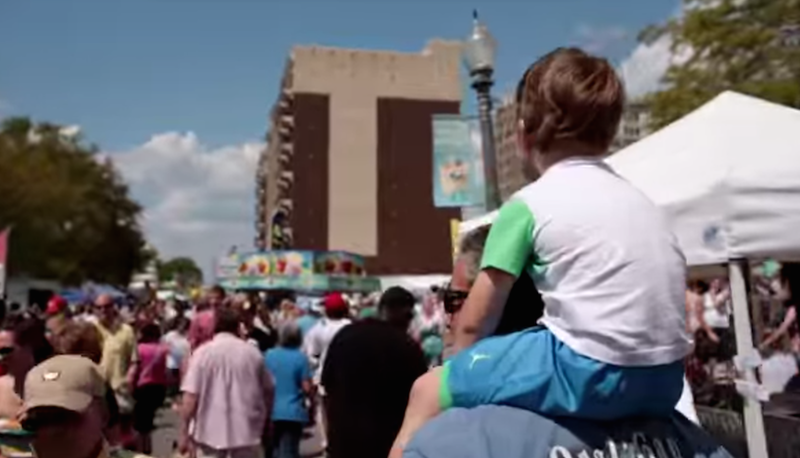 The Wilmington Azalea Festival (April 8-12) has taken over the city and for a few days, tourists from everywhere imaginable will cover the streets, alleys, porches, sidewalks down to the banks of the Cape Fear River... not unlike Kudzu. I like Kudzu, it grows on you after a while. In the midst of the milling crowd, MOG shall endeavor to help Advanced Energy and society see the benefits of energy conservation as applied to America's daily drivers (four wheel types) along with industry. Headquartered in Raleigh, N.C., Advanced Energy is a planning, technical and engineering services firm that provides market-based energy solutions. We work with electric utilities, state, federal and local governments, manufacturers and a wide variety of public and private partners. Advanced Energy offers program design and implementation, consulting, training, testing and research to provide market-based energy-related solutions for our five markets: Buildings, Industrial, Motors and Drives, Renewables and Transportation. During the Azalea festivities the AE folks have set up a table top display to tout the above described contribution they make. Since it is literally out front of the MOG headquarters, the urge to assist as a volunteer at their booth, is irresistible. 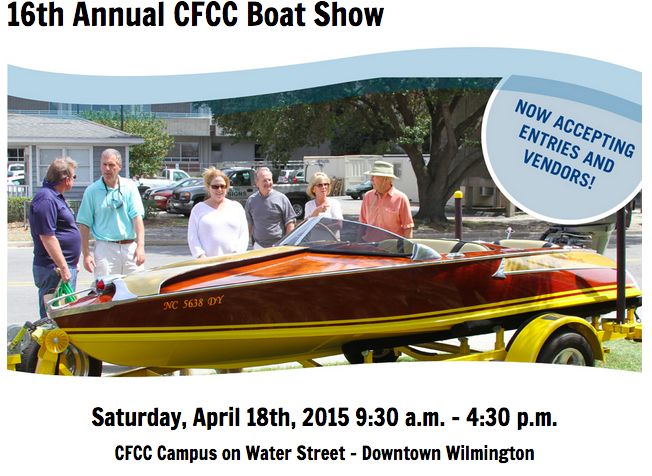 Next weekend we will be in the water at the Cape Fear Community College presentation of their annual CFCC BOAT SHOW Festival (hand crafted wood and classic boats) set for April 18, 2015 from 9:30 am to about 5pm. 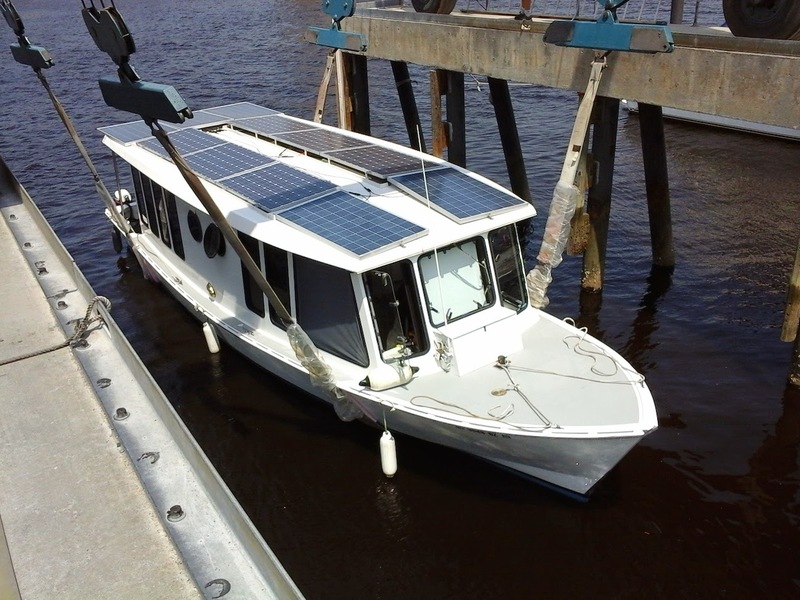 The MOG, Algemac II, will be among the biggest at the dock and of course the only TOTALLY solar electric yacht. The motors will be run at your request and if it is really hot, the air conditioners will be on full blast too. So if you are too busy to attend the Azalea Festival you can see us later at the CFCC BOAT SHOW. 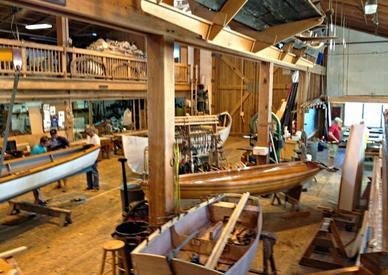 In Beaufort, NC on Saturday, May 2nd, 2015, we will have a table top display along with the MOG Concept Craft Model inside of the Beaufort, North Carolina Maritime Museum, WaterCraft Center. Come see the future of really total solar-electric boats and yachts. See you there! We will endeavor to keep you well informed of the Great Loop start, right here in beautiful maritime towns and cities of North Carolina.